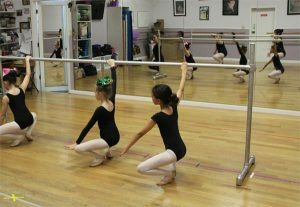 All dancewear is to be purchased from the studio for your convenience and uniformity in class. 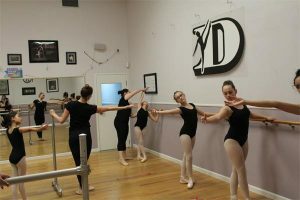 Student wears solid black one piece leotard, black stockings, our studio brand pink ballet shoes without strings, and our studio brand tan flat tap shoes with straps (no ties) The mother wears comfortable clothing, tennis shoes or socks. If you have dance shoes, you are more than welcome to wear them. (Please see below for stipulations on dress) Leotards should not have skirts or embellishments attached such as ruffles, rhinestones or appliques. Solid black one piece leotard, black stockings, our studio brand pink ballet shoes without strings, and our studio brand tan flat tap shoes with straps (no ties.) (Please see below for stipulations on dress code.) Leotards should not have skirts or embellishments attached such as ruffles, rhinestones or appliques. Solid black one piece leotards, black stockings, our studio brand tan tap shoes with buckle and our studio brand pink ballet shoes without strings to fit snug. (Please see below for stipulations on dress code.) Leotards should not have skirts or embellishments attached such as ruffles, rhinestones or appliques. Solid one piece black leotard, pink stockings, properly fitted pointe shoes. Pointe shoes need to be specially fitted to each type of foot. We ONLY RECOMMEND Carmel’s Dancewear for pointe shoes. (No pants, shirts or shorts allowed) Do not buy pointe shoes until you are approved by Debby Dillehay. Solid one piece black or other solid color leotards, black or tan convertible, footless or stirrup stockings, and our studio brand tan jazz shoes. 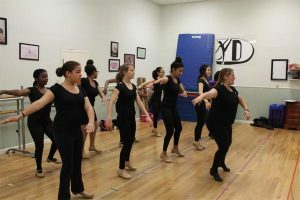 Students need a pair of knee pads in their dance bag. Solid black dance pants (biker short, ankle or capri length) may be worn for this class. If choosing shorts, they must be worn with stockings. Solid one piece black or other solid color leotards, black convertible, footless or stirrup stockings, our studio brand half sole lyrical shoes. Students need a pair of knee pads in their dance bag. Solid black dance pants (biker short, ankle or capri length) may be worn for this class. If choosing shorts, they must be worn with stockings. Solid black leotard, T-shirt or tank top, solid black dance or hip hop pants (biker short, ankle or capri length), black dance sneakers (Please note if you are not planning on participating in the recital, any sneaker will do for class.) If choosing shorts, they must be worn with stockings. Solid one-piece black or other solid color leotards with biker shorts or bikertards (all in one leotard and biker shorts), no shoes or stockings. Black biker shorts or shorts (if wearing shorts, biker shorts or tights MUST be worn under) & a tight-fitting black or white T-shirt. 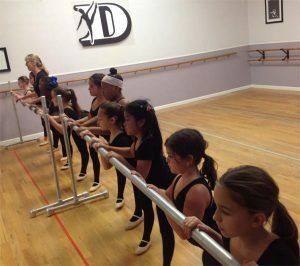 For dance classes boys wear black jazz pants or sweat pants, a tight fitting black or white T-shirt, black tap shoes, black ballet shoes, black jazz shoes, black hip hop shoes for each appropriate class. Comfortable clothing, preferably black, our studio brand black jazz shoes, our studio brand U-shell buckle black tap shoes, black dance sneakers for hip hop, pink ballet shoes for each appropriate class. Leotards should not have skirts or embellishments attached such as ruffles, rhinestones or appliques. When changing from one class to another requiring different stockings, please use convertible tights or stirrup tights so that you are not late for class. 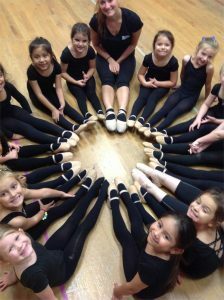 Stockings are dance tights, not pantyhose, and must be worn in all dance classes by all ages. No two-piece or loose fitting outfits except in hip hop. No skirts, shorts or shirts of any kind allowed in class for girls. HAIR must be tied in ALL classes in pony tails, braids, bun, etc. Shorter hair to be pulled back. If you want professional training, please dress professionally. We reserve the rights to sit a student out of class if not dressed properly, or hair not tied.